Late 70's re-issue as a 2-LP set (the original 1st pressing was issued in 2 separate LP's on the black INTERNATIONAL POLYDOR PRODUCTION label and with different sleeve). 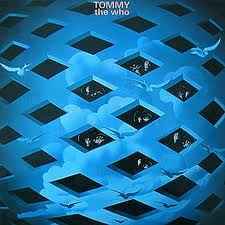 this is a beautiful GREEK copy of the classic 1969 rock opera tommy, this 2 lp set was not released in greece until 1973, the sleeve is a tri fold sleeve with a lyric insert ( no poster) and the sleeve is laminated and looks great, this was the first greek pressing of this lp 4 years after it was released and im 99% sure it was the only greek pressing ever, really nice!!!! !